(Nanowerk Spotlight) Deteriorating ocean ecosystems caused by climate change, pollution and overfishing have triggered an increased need to monitor and record the changes occurring in the marine environment. Frequently, research by marine biologists depends on weighty and invasive sensory and telemetry equipment to understand and assess various aspects of the marine ecosystem. Researchers generally employ invasive attachment techniques such as drilling, stapling or wrapping firm Velcro bands to and around the animals, sometimes restricting their natural movements. These tagging systems can be quite abrasive and not so forgiving on the animals. The extra carried weight and the tag design can affect diving patterns, mating, nesting behavior, swimming drag, or movement of marine animals, sometimes affecting the very behavior that these sensors were intended to observe and measure. In order to develop a multifunctional marine sensory platform that does not harm or upset the animals, researchers need to address three crucial design features: conformity, stretchability, and weight. A team in Saudi Arabia has done exactly that and developed a lightweight and compliant smart skin that integrates the main desired sensor arrays for continuously logging salinity/conductivity, temperature and depth (also known as a CTD tag) in deep oceans. All at a much lower cost than the conventional marine tags used today. They reported their findings in npj Flexible Electronics ("Compliant lightweight non-invasive standalone “Marine Skin” tagging system"). "This is the first demonstration of a waterproof smart skin made specifically for marine animals, and that can withstand the harsh environment of the deep oceans, such as extremely high pressures and high salinity levels," Muhammad M. Hussain, a Professor of Electrical Engineering at King Abdullah University of Science and Technology (KAUST), tells Nanowerk. "The flexible and stretchable nature of our Marine Skin tag allows it be epidermally and non-invasively secured onto the curvilinear surface of animals with no additive discomfort." Marine Skin is made completely autonomous through a compliant system-on-chip integration. The entire system – including the battery, integrated memory for data storage, and wireless communication via low power Bluetooth – is compact (21 mm x 10 mm x 3.5 mm) and lightweight (less than 2.4 grams). "Effective marine sensors must survive the particularly corrosive saline aqueous environment (35-40 practical salinity unit, PSU) and maintain high sensitivity and repeatability," explains Joanna Nassar, Ph.D., the paper's first author. "Therefore, the development of our Marine Skin tag required a compliant packaging material that takes into consideration biocompatibility, toxicology, cost, endurance in saline environments, temperature and pressure working ranges, and degradation with time." "The appropriate packaging material also needs to comply with the soft elasticity of the hosting surface, minimizing any kind of discomfort caused when the tag is placed on the often soft asymmetric surface of marine animals, and supporting freedom of movement without any restrictions," she adds. The team chose PDMS as their conformal packaging material and an ultra-thin geometrial 'net' architecture for the sensor array. The fabrication process is conducted using a low-cost CMOS compatible approach, allowing ease of scalability, batch fabrication, and precision. 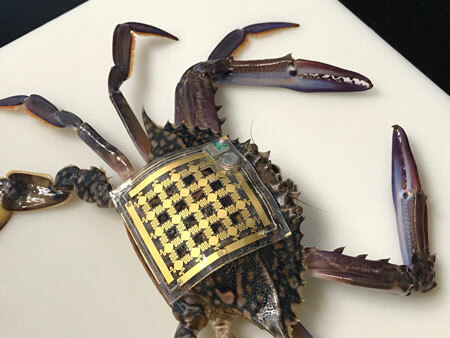 In a real-life experiment, the team mounted their sensory tag onto a swimming crab (Portunus pelagicus), demonstrating that it is able to continuously log the depth pattern of the crab while measuring temperature and salinity levels within the harsh ocean environment. Next, the team will expand the functionality of the Marine Skin tag by adding location tracking (GPS) and gas sensors to monitor pollution levels. "We are working with the Red Sea Research Center at KAUST and external collaborators to further expand testing on a variety of animals such a dolphins and whale sharks," notes Hussain. "We will continuously monitor and log data from the animals as they are moving in their natural habitat, perform data analysis and deduce correlation with the health of the marine environment and ecosystem." "Electronics are key enablers to better the state of our lives and the world we live in. The future of electronics will no longer be restricted to human beings, but to all living species, from marine animals to plants, all integral parts of the healthy ecosystem of our planet," he concludes. "Reshaping electronics to include all living species can unveil a wide range of opportunities and innovations. And to make an impact, the challenge will forever be to maintain simplicity, practicality, and cost."